Five killer whales have been named as plaintiffs in a lawsuit which argues they deserve the same constitutional protection from slavery as humans. 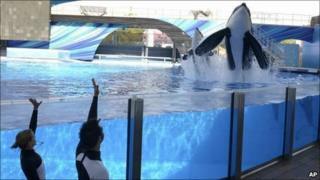 A US judge is considering a complaint by People for the Ethical Treatment of Animals' (Peta) against SeaWorld. SeaWorld's legal team said the case was a waste of time and resources. The marine park's lawyer, Theodore Shaw, told the court in San Diego: "Neither orcas nor any other animal were included in the 'We the people'... when the Constitution was adopted." He said that if the case were successful, it could have implications not just on how other marine parks or zoos operate, but even on the police use of sniffer dogs to detect bombs and drugs. The lawsuit invokes the 13th Amendment to the constitution, which abolished "slavery or involuntary servitude" in the US. Jeffrey Kerr, the lawyer representing the five whales, said: "For the first time in our nation's history, a federal court heard arguments as to whether living, breathing, feeling beings have rights and can be enslaved simply because they happen to not have been born human. "By any definition these orcas have been enslaved here." It is not Tilikum's first time in the media spotlight - he drowned his trainer before horrified spectators in February 2010, prompting a ban on the Florida park's employees entering the water to perform tricks with the orcas.